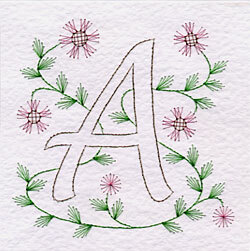 Seven card designs featuring the initials A through to G have been added to the PinBroidery pattern collection. More initials will be added in due course. These PinBroidery initial patterns make beautiful personalised cards for birthdays and other special occasions. The patterns are supplied in two sizes; 144 x 144 mm (5.65 x 5.65 inches) and 120 x 120 mm (4.75 x 4.75 inches). This gives you the flexibility to choose the size that suits your style of card making and to comply with any postal regulations on large sizes of cards. Please let me know how you get on with the initial designs in a comment to this post. This entry was posted in PinBroidery and tagged new patterns, PinBroidery on Monday 21 December 2009 by David Jefferson. Your cards sound great Cathy. I look forward to seeing them when you have your computer sorted. David.